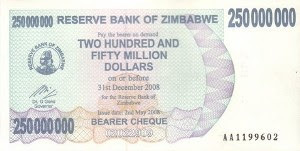 Zimbabwe’s country’s annual inflation rate is 231000000%, according to official statistics.Hyperinflation. A loaf of bread cost Z$200,000 in February. Today it costs Z$,600,000,000,000.The mind boggles. Zimbabwe was once a major food supplier to Africa but the economy has come apart since attempted reforms destroyed the agriculture industry.Zimbabwe has introduced a $250 million note recently as the country tries to ease the effects of hyperinflation. The main cause of such hyperinflation is a massive and rapid increase in the amount of money (estimated at 17,000%), which is not supported by growth in the output of goods and services.This results in an imbalance between the supply and demand for the money (including currency and bank deposits),accompanied by a complete loss of confidence in the money, similar to a bank run. The inflation is also exacerbated by a shortage of supply. Because basic goods are in short supply it is easy for market prices to be increased causing a spiral effect of upwardly rising prices.